So, now that I have my mini-cnc, I have this project of building a bigger machine ( with a moving area of about 90x40x15 cm ). I'm still searching for cheaper, I'll call local sellers when I get the phone installed. So angles will be 20mmx20mm, 2mm thickness, with 5mm holes. Any idea, comments and critics are more than welcome. 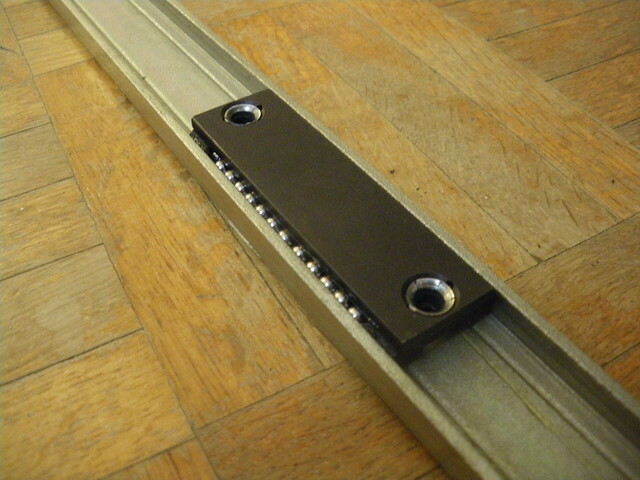 I want my big machine to be belt-driven, with X supporting Z supporting Y.
http://www.contraptor.org/make-linear-bearings : the rails are at least 40cm away, that's very far for these, I don't see how to make it work. The beta elements in vitaly's photostream seem nice, but I don't krow enough about these. At first I tough about using something like this or this but they are expensive, and not very contraptor-y. So I started designing something that works a bit like these, but can be made with contraptor components. Bolts not pictured here, but of course every bearing is supposed to be attached with 2mm bolts. 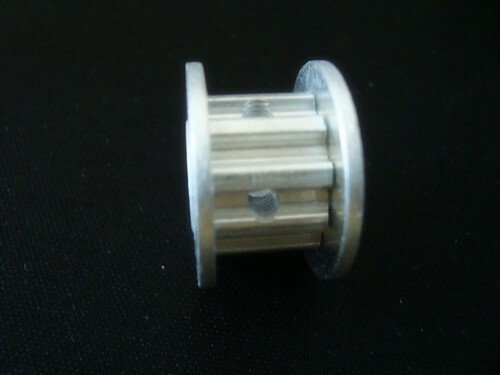 For a rail bar with a 10mm diameter, the bearings fit just exactly inside the U element, and there is room at the bottom to support the rail so that it does not bend. Do you think this would work ? This could work, but if you want to use smooth rod as a linear rail, I'd suggest a simple mount for sleeve bearings (plastic or bronze). 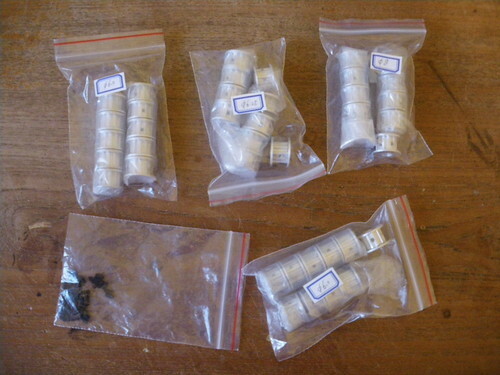 The sleeve bearings are widely available and pretty cheap. 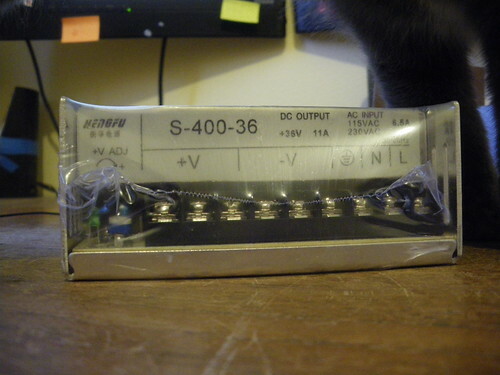 In fact I had bought a few for this same purpose - to add smooth rod linear motion to Contraptor. I had made a few design sketches a while ago, but have not finalized them. And nothing tested yet. I should probably put up a few pages "design in progress". If you want, I can email the sketches to you. Depending on what functions you envision for the Contraptor clone, you'll probably want specific mechanical properties for the elements/components. For CNC machines, even a hobby class, it's important that the structure be stiff, i.e. bend as little as possible under load. This is probably the most important consideration to begin with, because deflection of a beam under load is proportional to the cube of its length. If you double the length of a beam, it will deflect 2^3=8 times more under the same load. 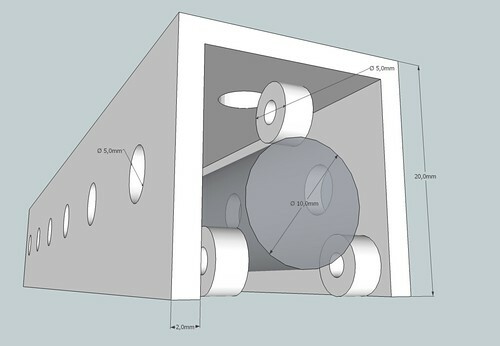 To compensate (using the same beam material), the cross section geometry of the beam must be modified so that its area moment of inertia is 8 times as much as the old one. There are formulas to calculate the area moment for different cross sections, but there is generally a fourth power dependency from cross section linear dimensions. Assuming the loads similar to those expected in Contraptor (e.g. Dremel), a 1m long angle beam would probably need to be 4-5 cm wide to be stiff enough. Very interrested in the sketches. 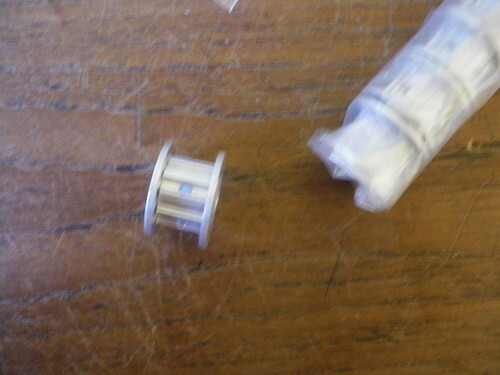 I discarded sleeve bearings because I thought there would be too much friction/resistance ( the machine being belt driven, so fast, but I've never seen some used so that's just my imagination at work ), and though of using ceramic linear plain bearings instead, but later on discarded these because I wanted something that can be made using contrapteur parts ( u element ). If my u-element based design can't work, I think I'll go with the ceramic plain bearings, but I'm still interested on seeing how the sleeve bearings work. About stiffness, that's the concern that made me do a open-at-bottom design, so that the rod can be supported all the way along/bellow ( with a t-angle, like in : http://www.mcmaster.com/#linear-shafts/=986160 ), so that it can't bend. I even thought because it is fully supported, I can use cheap copper tubing ( which is very smooth ) as the rail. But I'm not sure about that. I did read the metric version thread/pages a long time ago, that's what had me end up with contrapteur. About how close to the original it will be, I'd like it to be just a sized-down-to-openstructurse version, but that still sticks to every contraptor idea ( like http://www.contraptor.org/component-design ). If I have the time and I don't run into too much technical difficulties, the goals are to redo every subset, redo every example, redo the mini-cnc, and do my big-cnc, and document all of that somewhere. Just sent you the sketch with sleeve bearings; not sure about the friction there as I haven't actually tried them. I think it will depend on alignment and quality of smooth rod. U-carriage makes sense though since you're talking about supported rail. One thing to note is that the rail material must have sufficient hardness because continuous rolling action of the bearings will chew away softer material (aluminum, copper). For 2 lower bearings, their edge is in contact with the rail - this will quickly create grooves even in (unhardened) steel. Hardened rods in that link are pretty expensive, especially pre-drilled ones. I usually try to estimate the attractiveness of a design by cost per linear ft, and there is some threshold since the assembly may become almost as expensive as industrial grade LM rails+bearings (like THK). If there is a way to position two lower bearings at an angle, then I think plain steel tube might work. So I had a bit of time to think about this ( big-cnc project ). It's now becoming clear that the role of the machine will be to move pens and brushes aroud, so very little weight. That's why the design for the XY plotter seems quite good for this project. It's problem is it has no Z axis. I need at least 5cm of Z freedom ( ok, 2cm would be fine, but would reduce possible future uses for the machine ). 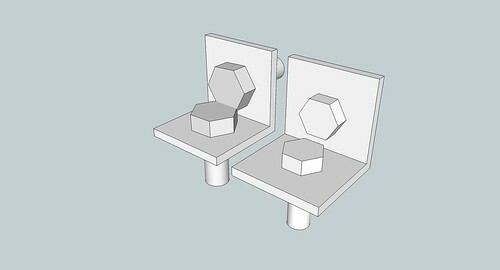 Dimensions are designed to fill a table I have, it will of course be 20mm openstructures-sized angles. 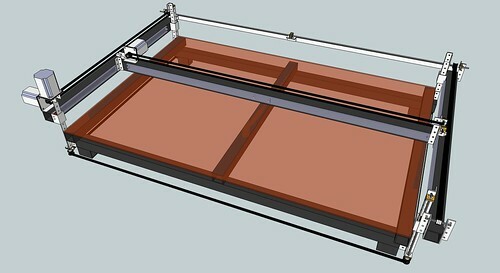 X axis will have a 120cm course, be made using two opposed Sliding Elements, and be belt driven. 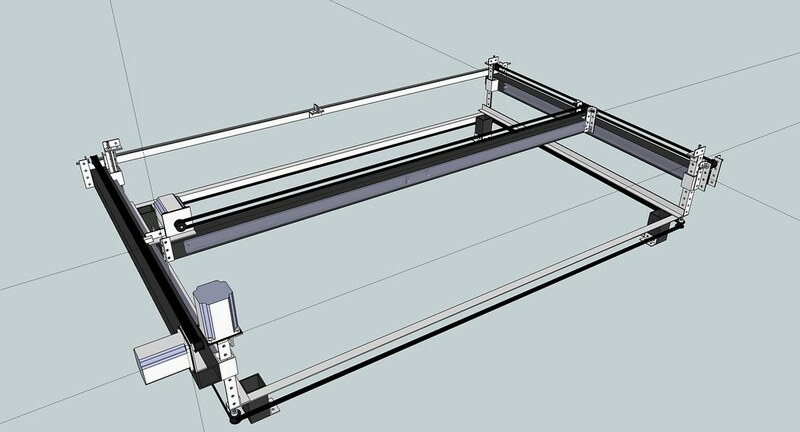 Z axis will be on the X moving part, have a 5 cm course, be made using two opposed Sliding Elements ( like the minicnc ), and be thread-rod driven ( I don't need much speed, but I need it to stay in place when the stepper is off ). 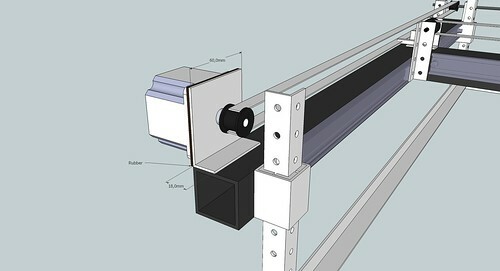 Y axis will be attached to the Z moving part, have a 70 cm course, be made of one Sliding Element and be belt driven. Draw and paint, very little weight, needs speed, space and precision. 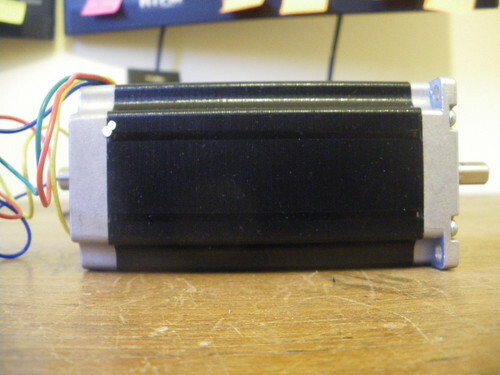 Move a dremel around like the mini-cnc, but does not need all the speed, and if weight becomes a problem I have a way lighter ( /5 ) alternative to the dremel that would work for what I have to do. Do you think that design would work ? ( If yes I'll start drawing it in sketchup then order the metal ). I like the Sliding Element ( no moving parts, simple design ) but at first discarded it because I thought with a belt driven system it couldn't handle the friction, but reading up on it and seeing the XY plotter example made me think it's maybe what I need. Any advice on the pros/cons of it ? Making the sliding elements will require using UHMWPE, but I can't find any source for metric sized angles of it. I hope I find some soon, or a way to make it work with empiric sizes. 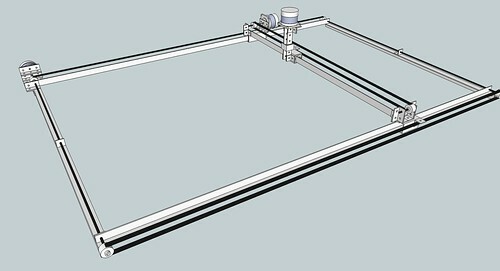 If you only need on/off type of Z axis, then I wonder if servo with some spring-based mechanism would work with the plotter. This is what I would do for drawing stuff with a pen. However, in case of XY plotter, sliding elements with belt drive give an error of about 1 mm - which may or may not meet your accuracy requirements. Accuracy will likely get worse as you put more weight on a moving axis, and/or you may have to accelerate more smoothly. At the very least, you'll have clearly visible backlash. This contraption: http://www.contraptor.org/fast-drilling-contraption, uses similar approach to what you're describing, although with a smaller work area, and Z mounted on X mounted on Y. The accuracy is not that great, primarily due to sliding elements-belt drive combination. If 1-2 mm or so error is acceptable and all it has to do is move around pens/brushes, it'll probably work. Not sure about Dremel though as it will need more stiffness. Keep in mind that deflection grows with cube of the length. 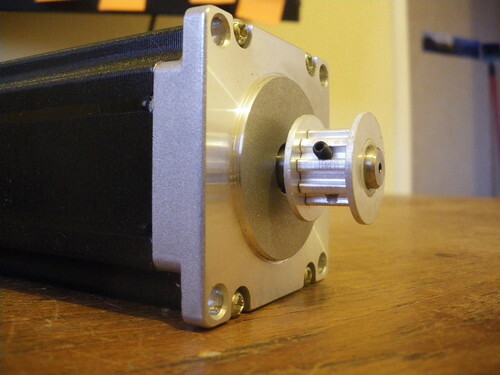 About the Z axis, it really needs the same kind of accuracy as the Mini-cnc has, so servo won't work. On XY, I need also sub-millimetric precision, so 1mm precision won't work. But I can give up speed, I don't need the 300 ipm the XY plotter has, 60 ( or maybe at worse 40 ) ipm when drawing would be fine, I need the speed more for non-precise operations like moving from a shape to another and refilling paint. The question is, can I get ( even if it takes time to adjust everything ) the same amount of precision as the mini-cnc ( no visible errors when drawing with a .05mm pen ) using belt drives, sliding elements, and with a 1200mm course ? The speed you get here would be fine, so maybe ACME rods is the solution, but they are expensive ( is this cheaper than mcmaster or am I missing something ? ), so it would be good to have a belt drive design. You seem to get a good precision with just half stepping ( I'll have 1/16, probably later 1/200 ) and at a very fast speed. And here you get a precision just a bit under what I need. That's what gets me thinking I can adapt the design to my needs. I'm kindof dependent on examples I can find and on knowledge I can borrow for this part of the design so any help is welcome. 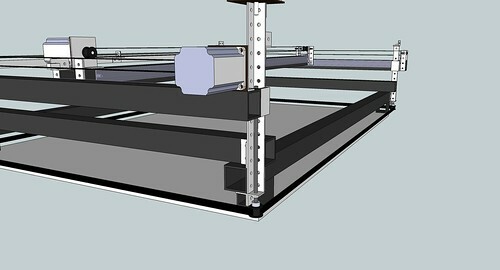 Also, Sketchup File ( click "Télécharger ce fichier" ). Short answer: I'm skeptical about achieving sub-mm accuracy. One question is sufficient frame stiffness. This calculates to ~0.01 in, which is ~0.25 mm. This is probably OK for drawing. However, milling is likely to be out of the question as the milling loads are higher. Accelerations will also load the frame, depending on how fast and how much mass you're accelerating. If you decide to build Y on moving Z, the weight (and deflection) will be even more. 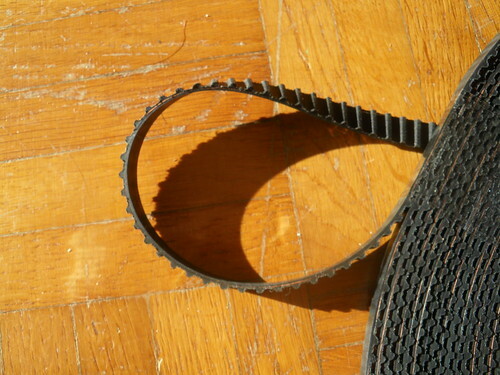 First, you have to make them somewhat loose if you want to use them with the belt drive. Naturally, this will result in a small amount of play that will add to the error. This also means that you can't really put any twisting/rotational load on a single element - such as the Z axis with motor on Y carriage like your sketch shows. 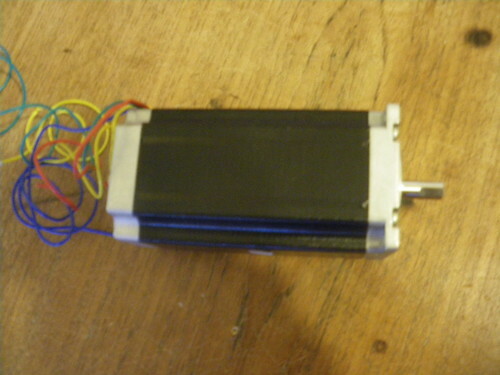 A simple pen, maybe with a servo could work, but an entire Z axis would be too heavy and would result in a wobble. Second, the belt is not entirely stiff and it takes a certain amount of force to overcome static friction to get the sliding element moving, even when they're loose. Imagine a heavy brick on a pavement as a sliding element and a long circular rope on two pulleys attached to either side of the brick. When you rotate one of the pulleys, the brick is moving. But when the direction is reversed, there is some slack in the rope that gets taken up before the brick starts moving in the opposite direction. This is backlash. Some of it is due to the rubber spider from the motor coupling (disk coupling would be the remedy for this). IIRC, on XY plotter (with standard motor coupling) it was ~1/32" (11"x17" work area). Longer belts and heavier stages will exhibit more backlash. Add backlash to the error. Also, I don't think microstepping will help here as the losses are in the transmission mechanism. You could use screws instead of the belts, but the twisting/rotational load on a single element (Y axis) will still be an issue. Also, each sliding element should be driven individually, otherwise the stage may skew and bind. 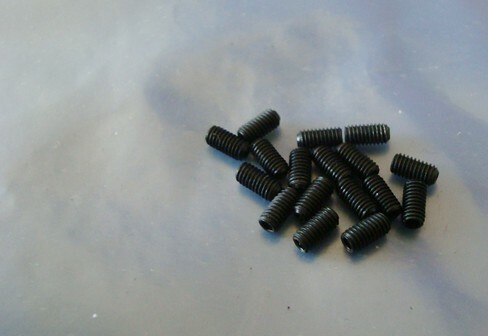 Driving each element individually would double the length of the screws. The cheap plain threaded rod will give you about 15-20 in/min and I think it's too slow for such a big work area. Fast ACME screws are pretty expensive - the one in the link has 1 start and moves 1/16" per revolution (25% improvement over threaded rod), while the one in the video has 4 starts and moves 1/4" per revolution. 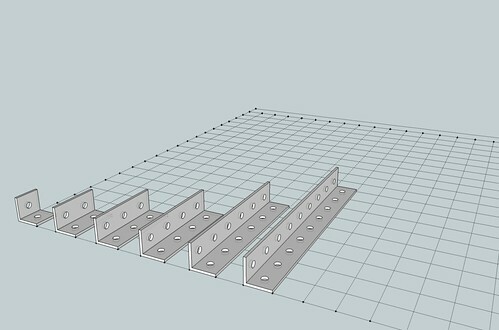 One suggestion may be to make Z stage a moving table on 4 sliding elements + threaded rods (a-la Reprap Darwin). Another is to make gantry the longest axis. To sum up, I think the Dremel/milling is out of question and I'm still skeptical about sub-millimeter accuracy on XY for drawing (assuming no load on the tool head), but the only way to tell is to try. You could run some tests on 18" long rail of Contraptor, loading the sliding element with the weights and measuring the error. The belt is included :) If you can get imperial angle locally, you could try the same test on a 4 ft length with the longer belt - this would be closer to what you're trying to achieve. Thanks for all the technical help, it's super usefull ! So I give up on belt drives, it now seems non-realistic for the precision I want. 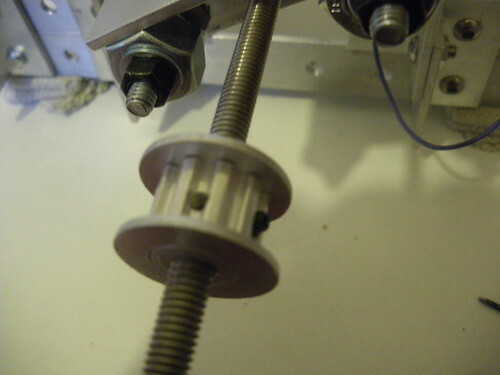 I'll use ACME rods, it also will make things simpler as I already know the threaded rods drive from the mini-cnc. From what you say I'm also guessing switching to ACME rods also makes the use of sliding elements less problematic. For the problem with twisting on Y, I'll change the design to one where no axis has to support Z, that is Z supporting X supporting Y ( or maybe a moving table like in darwin, but I think this could cause problems the darwin has not if I put much weight on the table ), so I will have less weight, so less problems when moving a pen around, and when using a drill. ( I made some tests about the twisting with contraptor angle and sliding element, and it seems that for the drill I intend to use won't cause problems ( it's about 1/3 the weight of the dremel ) if everything is well tight ). These changes solve the XY precision problems due to belt drives. So that leaves the problem of frame stiffness. First I'm changing it to the configuration where there is the least weight on the longer axis ( Z supporting Y ( 800mm ) supporting X ( 1200mm ) ) so Y just has to support the pen/drill, X just has to support Y and the pen/drill, and Z does all the hard work. I made a little bit of testing with a 20mm|1.5mm aluminium angle I have ( big-cnc will be 20mm|2mm ) that is 800mm long ( same as the Y axis ). Putting a 800g can in the middle makes it bend by about half or a third of a millimeter. Putting the small 12v drill I intend to use on it makes it bend a very little bit, but nothing I could measure ( I'd say 10 times less, not sure ). I'm not sure how these phenomenons would influx on the precision on the machine : is it just a problem for the Z axis precision, or for all axis ? I estimate the 1200mm aluminium angle will be about 220g. That's 110g for each Y stage to support ( plus the tool weight, which is ~0 for pens ). I'm not sure how much that would be for iron angle, but my current guess is that changing to iron angle will make the structure stiff enough to not have problems. Am I right ? I don't change the choice of sliding elements for the stages, as I don't see what other ( documented ) contraptor moving element I could use. The picture is the current design idea following your advice, I don't see for now what else I could change without replacing contraptor parts with costly parts. 1. PS: what do you mean by "make gantry the longest axis" ? 2. PS: is U angle stiffer than L angle, and square angle stiffer than those ? because if they are, this could help improve stiffness : I can get U angle easily, and could also use square angles if I move the nuts outside the sliding element … but I'm not sure they are ( stiffer ) . While the threaded rods will improve motion accuracy (at the expense of speed and/or $$$), they won't help with frame stiffness. You keep mentioning drill/dremel - while this large structure may work for drawing, the accuracy will rapidly decrease as all kinds of forces are applied to the toolhead. What do you want to cut with it? 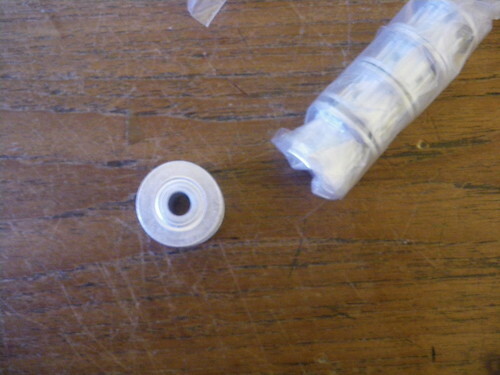 Also, don't forget that the ACME nuts for Contraptor are not manufactured - I had to make mine from a Delrin/Acetal bar. With drawing toolhead, I would likely use the belt drives, trying to improve accuracy as much as possible - by tightening the belts, using disk couplings and limiting acceleration. Mainly because threaded rods would be too slow and ACME screws would still be slow and too expensive. Finally, linear bearings can be used instead of the sliding elements to eliminate the issues with friction - these should help achieve sub-mm accuracy. If I was building something this size for even light milling, I would probably use 1x3" or even 1.5x3" T-slot. The angle is way too flexible for this. Regarding steel - yes, in many cases what you would gain in stiffness will be nearly cancelled by the same gain in mass - unless it's a stationary assembly. Also, I haven't tested angle iron with sliding elements at all - and I think there can be issues - such as lack of true 90 deg. angle or lack of smooth finish. So can't really say whether it would work. Thanks for your help and time ! The machine will be used about 95% for drawing, and 5% to drill soft materials ( like plywood or plastics ) or engraving ( like circuit boards, if possible ). Whatever I end up with, I will try to drill aluminium ( super slowly ), but if it does not work it's not a problem. So basically what I understand is that I can use belt drives, if I solve the problem of stiffness and if I don't use sliding elements but something more smooth like the linear bearings. The problem with linear bearing is that I don't find a metric equivalent to the "flat U" it uses ( only "square U" ). It's a linear bearing with "ball recirculation". 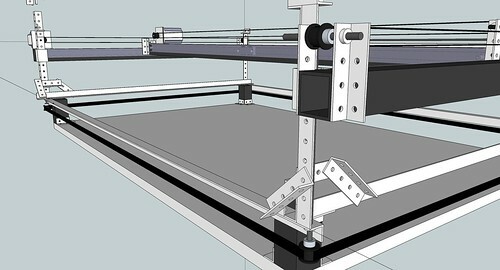 It can support 20kg ( or 10kg with smaller and cheaper stage ) when positioned vertically. 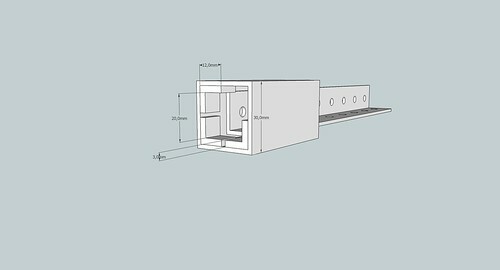 ( they even provide sketchup components ). I asked a quote, it would cost 35 euros for 800mm rail+stage and 45 euros for 1200mm rail+stage, so total 115 euros, which is fine for my budget. What do you think of those ? But this still has the problem that it must be fully supported to not bend ( I guess ), so it does not solve the stiffness problem by itself. I could use vertically positioned flat iron bar with dimensions anywhere from 30x3mm to 30x20mm to support it, the question is : how do I know what dimension will not bend. Also see at the bottom for questions about shapes. In the formula you gave me I don't see where this ( dimensions of meterial ) is taken into account ( and Wikipedia is not very pedagogic on the subject ), and I don't even know if it has influence ( my instinct tells me it has, aluminium angle being stiffer than aluminium foil ) ( edit : finally found it it's I ). Any advice on that part ? So that means I can get a better stiffness if I choose a better geometry ( I guess that's why you were suggesting T-slot ), the question is : what geometry is best ? ( T ? I ? box ? more complex ones like T-slot ? ) 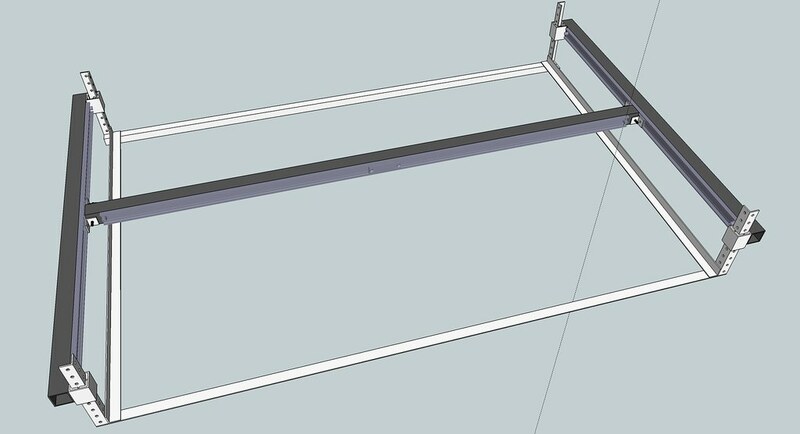 ( I'd love that square tube be a good solution as it's the one I have the easiest access to ( same shop as the angles ), and it's easier to integrate ). This says that I is best for one direction of bending, and square tube is best for two directions of bending. I'll try to calculate this, but my math is rusty. Note : y is "distance of axis to extreme fiber". I'm not sure where it is … I'm assuming it is in the center, if I'm wrong please tell me so I can recalculate. T is same as angle ( same equation ). Worst is horizontal flat rectangle. Vertical rectangle is not that good either at compared weights. Square tube does well compared to plain square, that sticks with what wikipedia says. I is about as stiff as square tube, but square tube has 1/3 more weight ( but I can buy square tube easily and 1/3 weight is not that bad ). All that tells me : best for me is 30x3 square tube ( same as for the sliding elements stages, that's two in one ). But I need to get the math right to calculate the deflection and see if it would be good enough. The linear bearings in the link look good, and the price seems reasonable - works out to be ~$15/ft for a single rail + bearing. And yes, the tube offers the best stiffness/weight ratio. The plugin seems broken : it does not place the centroid of a square tube at the meeting point of its two diagonals ( the plugin's author suggests there is something wrong with the algorythm used ). If that is what you used to get the area moment of inertia for contraptor angle, maybe that's why we get different numbers. I'll assume the equation I have for the square tube is right. Ok, so 30x2 iron square tube seems very good. I'll try to design a sketchup draft using that. I still need to calculate how much the finished 1200mm rail weights to compute how much deflection it will cause to the 800mm rails. But from here it seems that this solves the stiffness issues. It looks like the plugin may not work correctly for shapes with inner polygons, but the result for angle is consistent with the numbers I remember from early calculations. I'm not sure I can answer the accuracy question for milling. You would need to model your system taking milling forces into account. In addition to bending, the beams may also twist, forces will multiply under moment arms (vertical rails, toolhead on X axis), workpiece materials will resist differently.. Milling foam accurately would be a lot easier than milling hard wood, but if you go really really slow you could probably even mill aluminum. Also, when you have larger area, the first thing you'll want is speed - it's very demoralizing to watch the tool/pen take full minute or two to go from one corner to another :) This means you'll likely need more powerful motors (and drivers, and power supply) to move the heavier axes around at decent speeds without losing steps. About milling, I'm more and more seeing it as a bonus, I'll be happy if it works, but I don't worry about it. Also I changed the supporting bars to 40x3 ( more 20mm-y, also fits better/perfectly the chambrellan stage ) square tube instead of 30x2, which should give even better results ( calculations gave 1/100mm deflection, but I don't know the math for the other forces, so I'll try and see ). But for that I need to finish the sketchup design, and find where to order everything. I did a lot of work on my mini-cnc to try to reduce vibration and noise. One of the big problems I have noticed, is that not all screws of the motor are attached. Also, any part of the motor touching the structure transfers the vibration and makes things lots worse. ( you have to imagine the 4 screws, isolated with rubber ). The motor is separated from the mount by a 1-2mm thick rubber sheet ( bike tires ? foam ? needs trying ). It puts the center of the motor axis at 30mm from the "floor", that solves the inch-metric problem you can have with the nema motors. 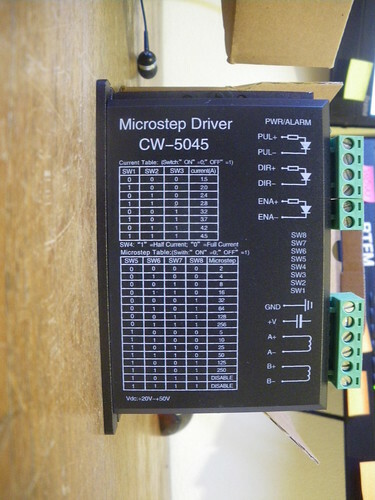 I'll build a first version using the same motor/driver configuration as the mini-cnc, and see how fast/precise I can get it, just to see. The brain will still be a sanguino. I'm looking for the same thing as contraptor ( XL 10 teeth ), as all the metric sized belts I found were way more expansive, so empiric belt, so empiric pulleys. econobelt 5,14 each, but with no screws for fixation so I must learn to do that myself. I need : (1,2×2)+(0,8×4)+(1,2×2)+(0,8×2) = 9,6 = 10 meters of belt. sdpsi 30$ for 100 inches, 10 meters is 393 inches, so about 120$. econobelt 26$ for 5 meters, so 52$ for 10 meters. So I think I'll go to econobelt, but I'm not sure I understand all the parameters correctly so mcmaster is maybe where I have the less chances of error. About 5$ at sdpsi and econobelt, I'm not sure how I could DIMyself. 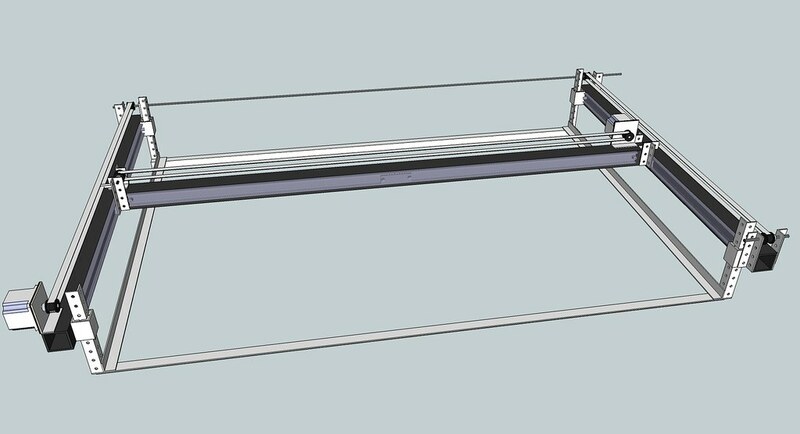 I think I can use belt clamps even for the Z axis darwin-like system ( the clamp must not touch the pulleys, so I must move the Z axis with no longer than about 1100mm, that is about 55 pulley turns, that is 55mm of freedom for the Z axis, which is enough ). That's all for tonight, thanks for reading. Ok so no "NOOOO DONT DO THAT!! ", I'll be presuming there was no big mistake in the message above. Now below is the 0.9 version of the design, it's as far as I can go with my knowledge, if it was just me, it would be what I would build, and see if it works. But please please please tell me if something is done wrong ! 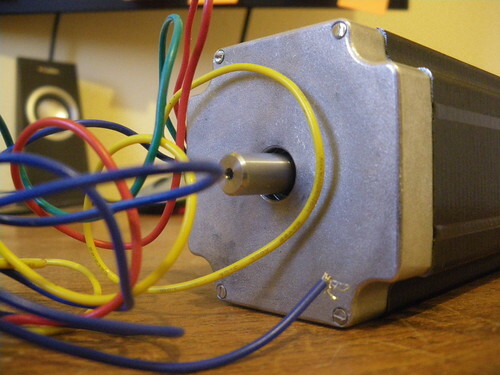 - Z motor needs better fixation. 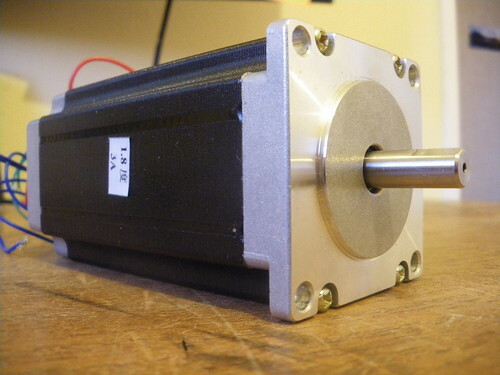 - X and Y motors need support bellow when upgrading to bigger ones. - Motors will have double shafts, so I'll put flywheels/dampers there. - Fixation for the ball bearings ( not sure I'll do it the way contraptor does, I have a few ideas I need to try ). The machine will be mounted with bolts/nuts to a 1200mm/800mm table, the dimensions are made to fit that. ( just starting to realize how big it is, I need a bigger house ). Tomorrow I'll be starting a bill of materials. The ball bearings will be 6x12x4 ( fits the angles size even on the inside ). I think the angles will have 6mm holes instead of 5mm, I chose 5mm randomly in the beginning, but 6mm fits better the threaded rods, pulleys, ball bearings, etc … and gives the possibility to use 5mm nuts where freedom is needed. Underlined, what has been ordered. Just ordered the chambrellan rails … I think the shipping is free to france … no going back now ! 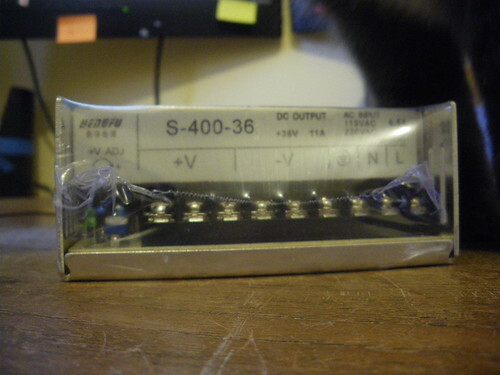 Just got a quote for the electronics/motors parts. 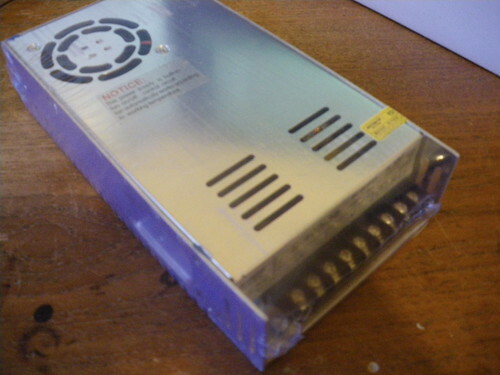 It'll be 390$ inc. shipping for 3 double shaft 425oz/in NEMA23 motors, 3 4.5A 256steps motor drivers, and a 400W 36V power supply. I may be adding soon diagonal bars ( like on the mini-cnc ) to the design to improve stability, seems after reflection like it is needed. Got a quote for XL 3/8" belt : 41$ for 30 meters of belt, way cheaper than econobelt ( wich is more like 150$ for 30 meters, mcmaster is more like 240$ for 30 meters ) ( still need to count VAT, customs and shipping, waiting on a quote for shipping ). Agrr, it's not very convenient to have to scroll all the way up in order to reply to the thread.. Anyhow, I still do have some concerns. For one, I think steel tube is overkill, harder to work with and weighs a lot more - I would go with AL. Another thing is I'm still not convinced that the frame is sufficiently stiff. Imagine four legged table up side down and try to move the legs - they're up in the air and fairly flexible. Also, if you're going for 4cm beams, why not use them throughout the entire frame? Answering here for later-reply-simplification, it's not very convenient to have to scroll indeed. Ok, so no steel tube … calculations said 0,05mm deflection for 1200mm aluminium tube ( 3 times that of steel, but still not much ) … if it's only mostly on the Z axis I can live with it. I'll be buying the both aliminium and steel tube, and if aliminium does not give good enough results, I'll experiment with steel tube. The moving Z axis legs problem is exactly what I was working on tonight. 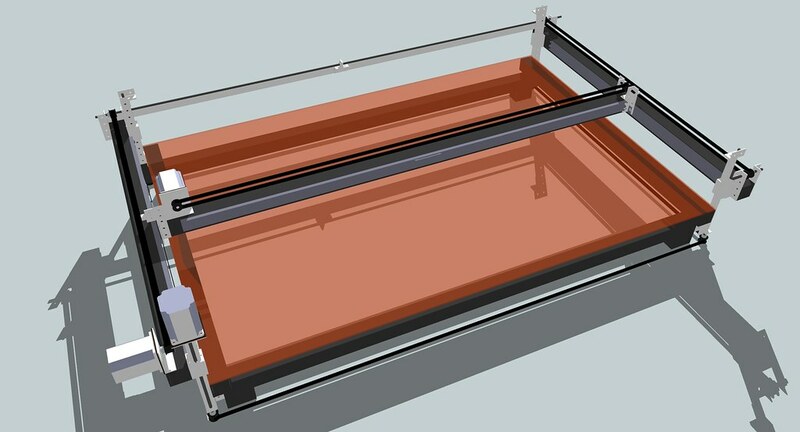 About the 4cm beams, the problem is that I don't see how to use them for Z axis. That would require 50cm square tube ( which I can get ) to put arount the 40mm square tube, but then where do I put the threaded rod etc … ? Or maybe with 40mm angle ? The problem is more in my mind : I'm trying to make the machine the more contraptor-y as possible, and the chambrellan rails and 40mm square tube already contradict that. The second thing I could replace with 40mm beam is the base of the machine, currently made of 20mm angle and a bit of 40mm square tube for the feet. 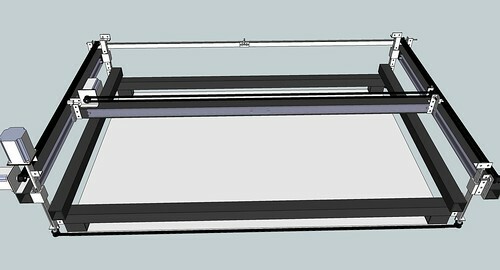 It would make the machine more bulky, but would also make it rely less on the table I'm planning on attaching it to, which is a good thing. 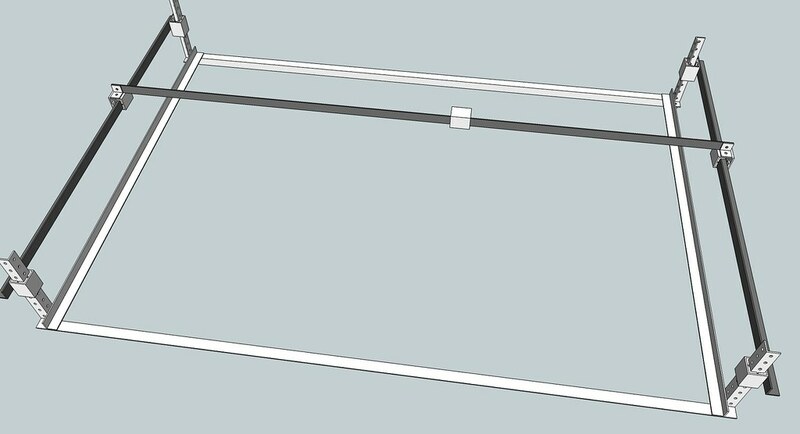 Also it would enable to attach the Z axis angles at 4 points on their base, thus probably solving the flexibility problem. But doing so would put the angle very close to the square tube, and thus the threaded rod, and thus the pulley. 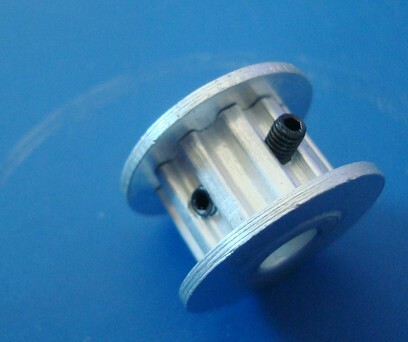 And the pulley being more than 20mm in diameter, it wouldn't fit. 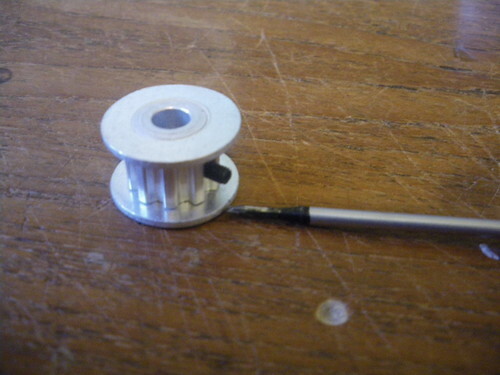 The problem is that I don't see how to make a base with the 40mm beam that would fit the pulleys/belts. I'll think about it and see if I can find something that works in sketchup. Edit : got an idea, will try tomorrow. Looks much more solid ! Thanks ! Also, got an interresting quote from china for finished ( drilled and cut ) contrapteur angle ( equal length for all sizes, that is 30 meters of 20mm angle, 30 meters of 40mm angle, etc .. ) , that amounts to about 650 euros for 270 meters ( I really need a bigger house ) excl. 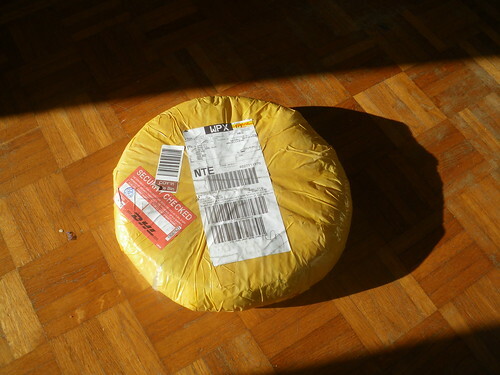 shipping ( that is 2,42 euros/meter, not that much more than raw angle if bought from europe, and way less than the raw angle from my hardware store ). Would drop to 1,385 euros/meter if I buy 1080 meters ( that is 15592 various contrapteur parts :) ), but that's too much for me. So 6mm bolts is not a good idea, will use 5mm. About hole size, 6mm holes is probably best for DIY ( to be used with 5mm bolts, same principle as contraptor ), but for fabricated, I need to get samples and see if precision is good enough to use 5mm holes. Just received the chambrellan rail. They look good, I think they will work fine. For reference, the total price all included for 2x800m + 1x1200mm was 149,26 euros. Looking good, will you need to drill holes to bolt them to the angle/tubes? Yes there are no holes I will have to make them myself. There was an option for holes at order, but it was too expensive. Also, they are bit noisier than what I was imagining, but still it's quiet enough. Added all the new contrapteur elements ( with lasercut parts ), minor modifications, replaced two pulleys with ball bearings ( inspired by reprap ). Also, closing in on getting samples for the aluminium angle from china, hoping it will happen before the chinese holidays ( all of february ). 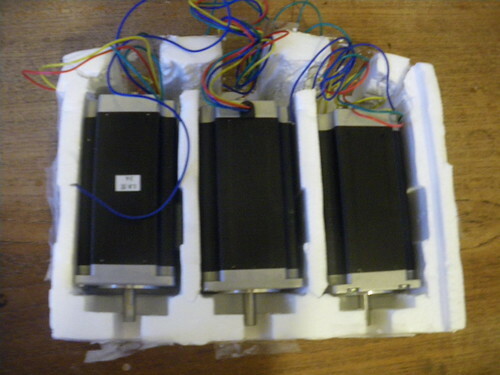 The motors and drivers are finally on the way. 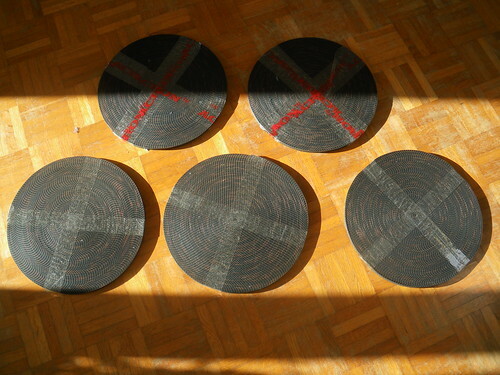 Received the belt, and pictures of the pulleys. Each roll is 30 meters, that's 150 meters in total. 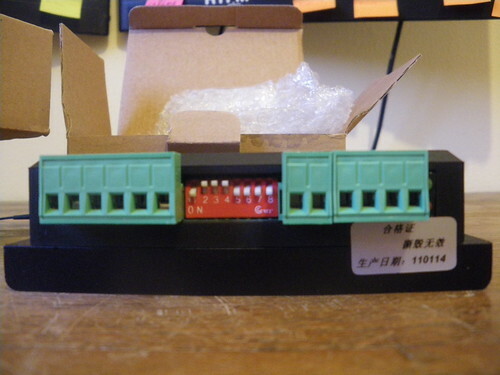 From what I can tell, the quality seems very good, as good as the mcmaster belt on the mini-cnc. Of course I'll know only after having used it in the machine for some time. The price was 133,915$ for 150 meters of roll, plus 60$ air shipping to France. Made a few experimentations to transform the open belt into closed belt : it seems like it can be done by sewing the belt back-to-back with a smaller piece for belt, I'll post the process if I end up with something that works. I find it very cool, I especially like the idea of having two screws, and the fact that it takes less room. But I'm not sure how well it works. 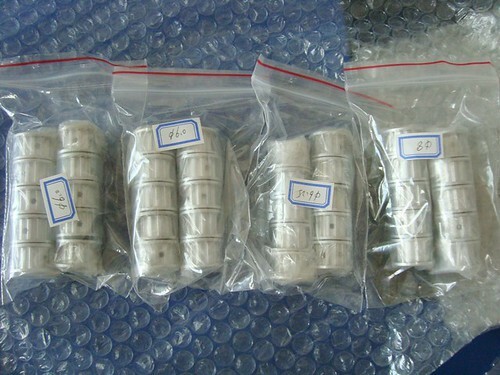 About the price, it was 89.52$ for 40 pulleys, plus 17.41$ for shipping to France, so 2,67$/pulley shipping included. ( Again econobelt is 5,14$/pulley without shipping, and mcmaster is $7.40/pulley without shipping ). That's all for today, more to come soon ! Nice. The pulley is kind of funny. With closed belt it would probably be a hassle to put the belt on, but the belt is open..
You never have belt all around the pulley, only on 1/4 or 1/2 of the pulley, so you just put the belt around the pulley, the pulley on the rod, and then theoretically you still have access to the screws to fix it in place. It may put you in a complicated pose for screwing it, but it is still possible in most situations, no ? Although.. it may only need quarter of a turn to tighten, so no big deal. 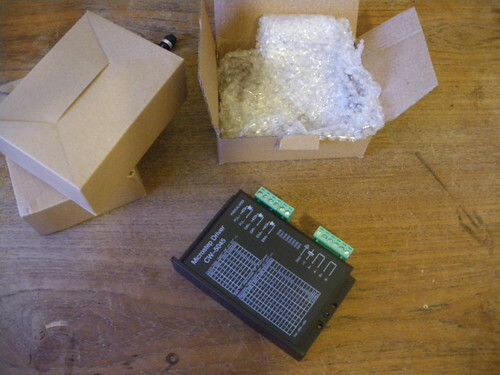 Yesterday two packages arrived : the drivers+motors+psu, and the pulleys. I asked 6,25mm bore for the pulleys for NEMA23 motors … it's actually 6,35 :( I can correct if I get my hands on a 0,25 inches drill bit … difficult. Everything looks to be in good shape, but I haven't tested anything yet. That's all for today, the angles should be there soon. As the plan is to begin with the frame, the build can now begin ! Will start a new thread for the build process, this one being for design considerations. Also, this may be a bit slow to begin : I'm also building a reprap, experimenting with the contrapteur parts, coding the smoothie firmware and designing the smoothie hardware … and don't want to stop doing any of it.